MADE IN SWEDEN Nimbus boats are built in Sweden and are designed to meet the requirements of the conscious yachtsman who appreciate proper functionality, comfort and safety. Properties we consider essential whether you go for a quick drive, a social weekend or a long international cruise. Welcome to the world of Nimbus and feel the difference. Award winning long distance cruising yachts comfortable living & social activities. COUPÉ CRUISERS Nimbus Coupé series has been refined to perfection since 1969 and sold more than four thousand boats around the world. With Nimbus Coupé series we strive to build the perfect boat for the conscious customer who enjoys social activities, comfortable living, easy handling and excellent long distance cruising properties. Some equipment shown may be optional extras and some options may not be available. See www.nimbus.se for further contact information and additional technical information. TH E N OVA S E R I ES Beautifully crafted boats with close to endless usability and the perfect social platform regardless of activity. With a Nova you are certain to enjoy many memorable days with friends and family. Some equipment shown may be optional extras and some options may not be available. See www.nimbusboats.com for further contact information and additional technical information. The 2012 model range is equipped with Simrad plotters and navigation systems. 32 Please note that standard cushions for 2012 are white with blue decoration. View the 360˚ VR tour at www.nimbusboats.com to view the latest images of the 2012 model range. Some equipment shown may be optional extras and some options may not be available. See www.nimbusboats.com for further contact information and additional technical information. The 2012 model range is equipped with Simrad plotters and navigation systems. 36 Please note that standard cushions for 2012 are white with blue decoration. View the 360˚ VR tour at www.nimbusboats.com to view the latest images of the 2012 model range. THE R-SERIES Performance hulls with true racing legacy designed for pleasure. A combination of exceptional handling and luxurious comfort. Suitable for those who understand and appreciate the difference between good and exceptional. 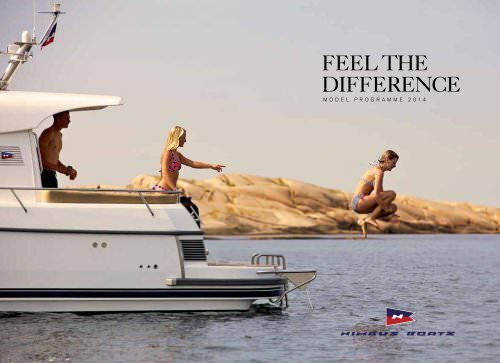 If you want it all performance, sociability and fun - the R-series is the boat for you. Bed set Product: 3191 The original Nimbus bed set. Two sets of pillow case and duvet cover. SEK 795:-. Piqué “Långedrag” Product: 4086 - Classic polo pique in combed cotton, striped taping in arm neck and slit. Size: S-XXXL Bed mattresses made in polyeter ”Supersoft”. The mattress is 6 cm thick and decorated with Nimbus quilted fabric.